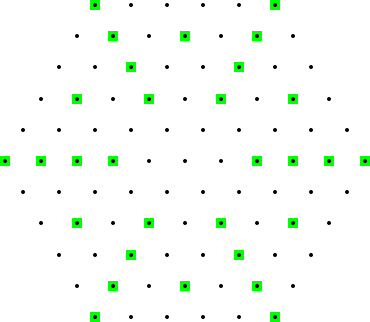 A hexagonal orchard of order n is a triangular lattice made up of points within a regular hexagon with side n.
Highlighted in green are the points which are hidden from the center by a point closer to it. It can be seen that for a hexagonal orchard of order 5, 30 points are hidden from the center. All six "triangles" of such a hexagon can be treated equal. I count only the points of the upper-right triangle and multiply the result by 6. The point in the centre doesn't belong to any triangle and is never hidden. All points can be thought of as fractions: the points on the right side of centre is 1/1. The next ring (actually: part of a ring, I'm only looking at one six-th of it) is 1/2 and 2/2, then 1/3, 2/3, 3/3, followed by 1/4, 2/4, 3/4 and 4/4. Finally the outer-most ring consists of 1/5, 2/5, 3/5, 4/5 and 5/5 for a total of 15 points. both numerator and denominator share a common factor such that gcd(n,d) > 1. The bruteForce() algorithm checks the gcd() of all fractions. It finds H(1000) within less than 0.04 seconds but becomes very slow for larger values (I assume it's O(n^2 log n)). However, I've seen similar problems before: counting how often a certain number if coprime to other numbers can be done with Euler's totient function (see en.wikipedia.org/wiki/Euler's_totient_function). Anyway, the number of visible points in a (partial) ring i is phi(i). Then the number of hidden points in that (partial) ring i is i - phi(i). The number of hidden points in a full ring is therefore 6 * (i - phi(i)). All I need is an efficient way to compute phi(i) for all i <= 10^8; that's the totient summary function (see mathworld.wolfram.com/TotientSummatoryFunction.html). (see sumPhi(), it takes about 3.5 seconds to finish). So I rewrote that sieve to work in a segmented way (see sumPhiSliced()): compute phi(x) for 0 < x < 10^6, then 10^6 <= x < 2 * 10^6, and so on. The memory consumption shrinks down to just 30 MByte and the program actually becomes a bit faster because of better cache locality (3.1 seconds, minus 0.4 seconds). Admittedly, the code isn't that nice to look at: I added my prime sieve from my toolbox and it takes quite some code to properly handle all edge cases. This solution contains 35 empty lines, 42 comments and 6 preprocessor commands. The correct solution to the original Project Euler problem was found in 3.1 seconds on an Intel® Core™ i7-2600K CPU @ 3.40GHz. Peak memory usage was about 31 MByte.